When it rains hard in Collierville, Tenn., a sewer pump station right outside the gates of the Shelton Road Wastewater Treatment Plant automatically becomes part of the plant. Designers at Smith Seckman Reid, Inc. (SSR) upsized the station's pumping capacity and installed variable frequency drives so that the pump valves, operated through a new supervisory control and data acquisition (SCADA) system, would switch positions to put the station in storm mode when flows reach 8.0 million gallons per day, sending the flow past the headworks and straight to the treatment process. The headworks originally was designed to handle 3.5 mgd, and the upgrade eased the bottleneck created during wet weather events. "This solution was less costly than building new headworks," said Tim Overly, Collierville's utilities director for the last 11 years. The price of the upgrade came in $206,296 less than the contracted amount. The savings were in construction and testing. 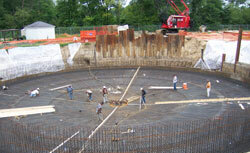 This project as well as another for the Northwest Wastewater Treatment Plant was funded through municipal bonds. pH and dissolved oxygen meters in the oxidation basins. The upgrade was driven by a 561 percent increase in population, which began in the 1980s, according to Bill Kilp, Collierville's director of Public Services. The Shelton oxidation ditch plant came online in 1981 and was expanded in 1987 to treat 8 million gallons per day. The improvements completed last July added 4 million gallons per day treatment capacity. Kilp explained that Public Services hired Camp Dresser & McKee (CDM) to develop a sewer master plan. "CDM looked at the entire system as well as the problems at Shelton—overflow and infiltration from rainwater," he said, adding that the consulting firm also studied the city's Northwest Wastewater Treatment Plant. The master plan projected needs 30 years into the future, addressing infiltration and inflow through increasing capacity and rehabilitating the system at the Shelton plant. "We had to have a pretty substantial rate increase," Overly said. The existing rates were not high enough to cover operating costs and pay for expansions, upgrades, or major maintenance projects. There had not been a rate increase in over 10 years. "We had sticker shock, but we're still tenth lowest in the state," he explained. In 2006 -2007, Collierville's wastewater treatment rate was set at $2.90 per 1,000 gallons. Overly noted that on Jan. 1, 2008, the board actually lowered the rate by 30 cents. Once the study was completed in 2005, Public Services sent out a request for proposals and hired SSR. Public Services contracted with Chris-Hill Construction for the Shelton project, which was completed in about 19 months. Brad Davis, who leads the civil environmental team at SSR’s Memphis office, explained why his firm made the changes it did. "We got rid of the rectangular clarifiers, which were somewhat of a hydraulic problem, maintenance and operation issue," he said. Overly added: "We always ran a thinner solids to press operations. 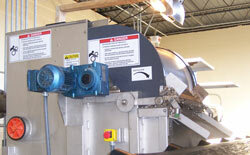 You need a thick blanket to efficiently run the sludge removal process." The team used modulating valves for the RAS/WAS, using one pump to control how much is returned and wasted. "It's a design efficiency," Davis noted. "We also metered both flows with magnetic flow meters, and we get better accuracy than with open channel flow meters." SCADA enables operators to dial in desired flow rates, giving them better control over the solids and treatment processes. Davis explained that the SCADA system is a custom-built open architecture system based on Rockwell software. "We do startup, set up the computer, build computer screens, and integrate the system at the plant. Anybody who knows how to work on a Rockwell system can work on our system." Scum, a classic problem at wastewater treatment plants, was recirculated back to the headworks at Shelton. At least, theoretically, Davis said. "It was trapped in the system. Now we have a scum removal system where it is captured and then pumped to a scum screen where it is screened out and removed on a belt conveyor with some screenings from the headworks." Brent Fowler, environmental engineer of SSR of Nashville, did most of the detail design work on the Shelton project. "We're very proud of the work we do in the wastewater field. One of the biggest things we pride ourselves in is our relationship with our clients—long-term and long-lasting," Fowler commented. For this project, the design team included Overly, the wastewater treatment plant supervisor, Public Services' electrician and engineer as well as SSR’s staff. Overly noted that the project had less than $40,000 in change orders, which "says a lot about the quality of the drawings the contractor got to work with." The Shelton plant received a "high passing grade of 3 (with 4 being the highest rating)" during the state's annual inspection in 2008. "Shelton Road has not had a violation of the permit limits in over five years," Overly said. "Before the upgrade, if we had a 2-inch rainfall, we would have overflow in the manholes. Since the upgrade, the screw pump wet well is never deeper than 1.7 feet."